I have often wondered about the penultimate scene in Alien, the discovery of the hole in the floor of the cockpit and its entry way into the egg silo or chamber. Was this simply the cargo of the ship or had the derelict landed on top of a subterranean Engineer complex on LV423? I always thought that the silo looked far too large to be part of the ship, and after seeing Prometheus and the Engineers ship layout it would seem unfeasible. I think this in itself would make a terrific film or maybe a flashback in Paradise to come. Yeah I noticed this also since I first saw it around 1980. The cargo hold looks bigger than the ship itself, so I wondered if it was a subterranian "cave of some sorts", as Kane puts it. But the cargo hold theory makes more sense, and its just a scaling error by the special effects department. Kind of like how the Engineer looks all too human in size in some of the scenes in Prometheus. May be a recurring thing with Ridley. I've read comments that the Coliseum is depicted as too large in Gladiator. All true. I guess due to the budget issues Ridley faced in production on Alien meant that he couldn't full fill his initial ideas. But, I think he could use it to his advantage by writing this into Paradise. It would be a nice idea to further tie Alien in with Prometheus and Paradise. I would love to see what actually happened both on LV426 and LV433. Didn't something dig its way down there? Dispite the fact that it's a discrepancy in the film making, I love this mysteriously odd demonsion to the derelict. I have two ideas on what it is 1.) The cavern was built automatically by the derelict as part of it's perpetual fractal terrorforming operations 2.) the derelict is like the Tardis from Doctor Who, making the derelict a portal down the Giger Tube that Alice didnt come back from! I agree the 'cargo hold ' is too big compared to the size of the ship. In the distant back ground of the picture you posted, it seems to go off in a different direction too. The chamber is not the same shape of the derelict. The idea of the silo, pyramid and ship was originally scripted, but sadly were not either filmed or edited out. It's another detail that can completely change the whole alien story line. The ship/cargo hold and pyramid/silo/ship both tell two different stories. Ship and cargo hold can suggest either it crashed there or landed. The pyramid ideal can suggest a base like that on prometheus. Accepted in the long run. I am going to try a new theory here. We all know that this ship is from 2000 years in the future. It could have been built to carry its bio-weapon cargo. I really never thought the cargohold looked to big for the rest of the ship. 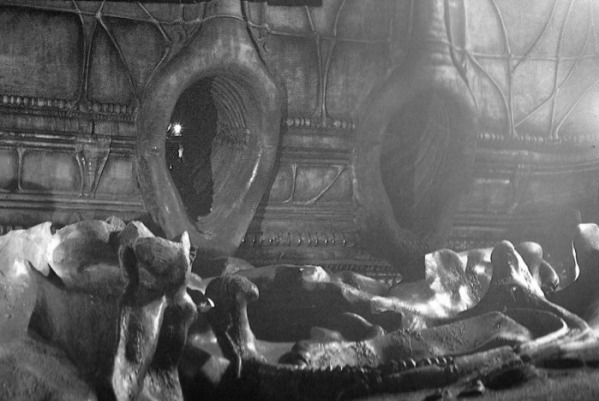 Ridley did use smaller sets for the navigation chamber on prometheus. I cannot say for sure wether he was trying to make us believe the Engineers where space jockeys from the original film. Honestly every time this topic comes up now it makes think we got shim shammed with the engineers. When I saw the art of the 15 foot tall engies I really liked that a lot. So all of this is a bit out of place for me. I hope this all gets sorted in Paradise. Redant, where do you get "this ship is from 2000 years in the future"? To my knowledge, time travel is not invoked anywhere in the accepted Alien cannon. Please let me clarify. LV223 Which possibly only has one Engineer in hybernation from 2000 years previously also has the ships that this Engineer tries to get off planet and go to earth with. LV423 in which the movie Alien happens on could possibly have a ship that is some 2000 years later after what we find on LV223. Just like we do not all drive cars from decades ago imagine what we would be using some 2000 years from now. Would we still be using combustion engines? It is also possible that all these events happen in a realtive time frame of each other we do not know the age of the shipe on LV423. I am only going on an assumption. This is just another problem we had with scale that Ridley tried to convey but then in other scenes just contradicts. As yes the Egg Chamber is larger than the Derelict, the problem we also have is that Ridley said that the Ship had crashed on LV 426 with a Cargo of Eggs. He has of late said that the Derelict had crashed and something had evolved from the Cargo. I have before tried to clear up the Egg Chamber by suggesting that the Derelict could maybe attach it self to the Cargo, like how Thunderbird 2 does, or like how some Helicopters carry a Large Cargo Crate via chains etc underneath, maybe the Derelict can attach to a separate Cargo Hold that it simply drops this Cargo Hold off then flies off. Then the Cargo Doors open and allow the Cargo inside to be able to then leave the Cargo Hold etc. This idea makes sense as to the whole purpose of carrying a cargo of Bio Weapons to drop on a World as simply how can Eggs survive being dropped just a Bomber would with its Arsenal? While the idea above is sound and plausible, it does have one problem to the keen eye but no more problem than if we accept the Cargo Hold is in the Derelict and not attached under it. That problem being again, how large the Egg Chamber looked when we see Kane climb down etc as shown in the image posted in the OP. They could still change things though, we could be made to forget what Ridley has ever said as far as Cannon goes and only go by what we could be shown... If Ridley ever on film explains LV 426, than another explanation could be that LV 426 is used as a storage facility for the Eggs. And that the Derelict was docking with this underground Egg Chamber. Ridley had hinted at the age of the Derelict, he said the ship had crash landed, (well he said it had gone to land but last minute there was a hick up) This event had occurred within a few hundred years of the events of the outbreak on LV 223 that wiped out all but one Engineer. So Prometheus is set near 2100 thats the events of the Last Engineer and the movie. The dead bodies they found of the Engineers had been there for around 2000 years give or take they said. Ridley also said the Engineers Technology was over a Million years old, this was his first hint that the Derelict may had been on LV 426 for maybe a Million Years, but his other comment about the crash landing occurring within few hundred years of the LV 223 outbreak 2000 years before Prometheus, would suggest that the Derelict was on LV 426 for about 2000 years also. Give or take few hundred years. But his Engineers Technology Question gives us a idea that maybe they had the Juggernaught class ships and Space Jockey suits and Pressure suits for maybe a Million years or few Million. Or again he could be on about the Goo that we saw in the opening Scene, but if that was Earth well the movie would show us this scene had occurred at latest 500 Million years ago. As i think the movie is depicting Engineer intervention around the time or after the Cambrian Explosion event. However Ridley did say that the Sacrificial Scene does not have to be on Earth and is just a way to show how these Engineers seed their Genetic Material to allow complex life to start to Evolve. @Redant....I agree about the possibility of time travel. In fact the more I think about it the more it makes the nonsense make sense. A quantum time continuum reflux distortion paradox quagmires of incomprehensible complexity. Screw Carbon dating technology here. Anyway there is a such a thing as time travel within the Movie as far as one way travel..... Cryo Sleep is Time Travel, if you invented Cryo Sleep Chamber and it could last as long as the Engineers ones. However looking at the Derelict Craft at the Crash Site and then looking at the prop, and then looking at the image when Kane was lowered down into the Egg Chamber we can see the halls of this Chamber curve around, so it follows the boomerang shape of the Derelict. This pretty much confirms it is part of the ship, and the only problem we are left with Again is the Scale. We have to remember Ridley intended this craft to be HUGE! the first glance we get at the Space Jockey was to create the illusion of a 26ft tall Race, but they scene seemed to show us he was about 21ft Tops, but still looked big. Only when we see the crew enter the ship and from outside and difference in height and height we see in Aliens, shows that there is no way the Egg Chamber and larger looking Pilot room shot would fit inside such a craft. So i guess Mr Ruhaniya we cannot rule our TIME TRAVEL.... as the only way the Derelict makes sense is......... if it is the same as Dr Whos TARDIS... that would explain how something can be vastly larger inside than it appears on the outside..
A cargo hold but yeah the scaling error is a tad distracting. Anyway, it's interesting to compare the two cargo holds; one is a chilled room with stacked pillars of Ampules and the other something more akin to an incubating farm. It's interesting to ponder whether the Engineers used worms to cultivate the eggs, given the wormy attributes of the classic xeno lineage, I wonder if the comics will address all this in more detail. You have raised a spectacular point! Indeed! Just because we all see the melted hole that Kane goes through we assume only that the area where kane goes into has to be part of the ship. I like this idea a lot that Kane goes into a cavernous area underneath the ship and why not! In the original script they wanted to have the aliens be discovered in an underground pyramid. Seems to me maybe Scott thought that a pyramid would distract totally from the Alien's mysterious nature and I would have to agree. Going into the film if we personify the Alien creature with a very clearly defined pyramid structure then it is not as scary and as such it would have been a much different film. Alien is a masterpiece I do not care what anyone says. The movie is far better than almost all sci-fi horror movies produced today. I go back to it again and again and never tire of it. This area where the eggs are discovered was conceived by Ridley and the effects crew. O’Bannon was amazed at how well they were able to take what he had written from the first part of the screen play an enhance it into what you see in the movie. Thank you for that wonderful post you made my day. I think from now on I will consider this as what really happens when Kane goes through the burned acid hole in the ship. He goes down into an Engineer underground cavern where the millions of Alien eggs wait for transport. Outstanding! What if the cavern wasn't even built by the Jockeys...? What if the Derelict landed on LV-426 for whatever reason, whether it crashed or not, and happened to land on top of another Alien structure, which housed the Alien eggs? We saw no type of similar "barrier sheild" in the Juggernaut from Prometheus. Remember too, the Alien was put up on a mural in one of the rooms in the temple on LV_223. I've said it before and many others agree, the "Xenomorph" could be regarded as the higher being, or the blueprint to whatever the Engineers were working on in their facility on LV_223. Perhaps the beings which created the Engineers, originally created the Xenomorphs and stashed them across the galaxy, along with other "perfect" organisms and as a result of their discovery by the Engineers, they attempted to mimic the power of creating and altering life, much like scientists do today. More over, I think the Alien organism itself is the goal for the Engineers and the main purpose for their testing on LV_223 and probably many other installations. They probably used LV_223 due to it being close to the LV-426, offering easy recon of samples from LV-426 to further their testing and studies. Notice the Urns, similar to eggs, but lacking the 100% organic nature. The Engineers managed to understand some of the secrets hidden in the creation/alteration of life, but obviously created an unstable product. Much like Humanity in this Universe, creating the Android to mimic the creation of life. I think it's the same issue just on a whole other level. The truth and the message I believe Prometheus and Ridley Scott are trying to convey is - we will never achieve such a feat as the creation of true life. We might be able to alter life, mutate it, even create intellegence, but no matter how hard we try, we will never be able to unlock the key to creating a Soul - which was a main point Weyland brought up in his "holographic speech". David will never have a soul he says. To further add, the Xenomorphs, since they have no eyes - and they say "the eyes are the window into the soul" - leads me to believe that the Xenomorphs themselves were a "false" creation and thus could "live" but would never have a "soul". Not "true" life. Prometheus will never answer the question of who created us and it will never show "God" - it can't. But it will insinuate that the same challenges we face today will remain a challenge forever, and remind us that there are universal challenges which we will never be abe to explain or exploit. Wow Chris , I am sold . So the engineers are like the goa'uld from star gate in the sense that they go around stealing ancient technologie and acting like gods ? God who was behind all of this. BIG MISTAKE. Why this basic mistake ? Million people dies out of the blue the world catches up. World be the place it is today ? of the universe like 2001 did . I reviewed Kane descending into the egg area and he says "a cave a cave of some sorts". Then I looked at the curvilinear sides as he is being hoisted down into the structure as well as when he is walking through each of the rows of eggs. This curved space is defined for a space ship. Space ships come in just about any shape and size; however, when it comes to the kind that engineers travel in then this underneath area is a match for their space craft down to metallic rounded structures. One thing clearly stands out. Structurally the same metallic elements are repeated parts of the structure of the space craft. We can logically think then that Kane is in part of the ship. We have to always keep in context that these original space jockeys were to be over 20 feet tall. It is also clear that Kane as he is going down into the structure is going down into another part of the same structure as the space ship. this were not part of the engineer space craft. Back to what BigDave said about the scale issues. I am now of the opinion that Kane is in a lower part of the space craft and we are just dealing with a technical issue of size and scale. We have to think these space jockeys could easily climb up the wall or walk through this thing and the structure around them would not be so big around them. For a twenty foot tall being could you imagine the size of the equipment they would use if it had to go through this area of the egg chamber. I am sure that they have things that they use that are much larger than they are tall hence the need for a larger curved structure underneath the navigation control room. If the ship is on another structure, which is possible, it is on something built by engineers or the who or what ever controls the engineers. I would like to comment about the origin of the alien as it pertains to the engineers. I think the engineers made the Alien as they made us. It is evident that our DNA matches theirs. We come from them. The Prometheus movie clearly defines this. Why they would need to create us, evolve us, come visit us and tell us where they are on a world where they are making weapons of mass destruction may be revealed in Paradise. We have to surmise that in order to make a weapon powerful enough to attack whatever is their intended target they would need the Alien to be evolved itself in a way so that it could contend with any enemy capacities. We test weapons on many things before we use them I am sure they are doing the same. I think they uses us and the Alien as a large scale test to see how well the Alien can defeat us and how we will respond to it in many different environments. It is not enough to fight an enemy with what you may have on hand at the current moment but what you will need to ultimately win the war. The race of aliens that the engineers come from may be in a war that has already lasted thousands of years. We are always trying to compare what we know or have done in our history and apply it to this situation. The Alien is a nano-mech-bio-weapon. It combines with an entire planets ecosystem and takes over every living thing on that planet. In space it is equally as dangerous. It is not the kind of thing you want on your space craft. We are missing a large piece of the story here and it has been for far too long. A lot of people on this site know exactly what I am referring to when I say nano mechanization as opposed to an organic based nano function that is made of almost exclusively organic elements. Nano Mech as it applies to the Aliens composition is not primarily based on organic elements and so it can be quite complex to even try to extrapolate how this thing is a machine at the nano sized level of it's construction. The Alien skull that we see in the predator ship in Requiem should have never been shown because the Alien does not have a skeletal bone skull in Aliens VS. Predators. A pred slices clean all the way through one of the Alien heads and there is no skull there at all. So even when they made these movies they were not in real agreement as to what the Alien was or is made out of and by who. It is difficult to keep track of all of this and frustrating as well. There has to be good consistency in a movie or you do not know what to think. There is something interesting in Prometheus that I noticed which might be related back on our topic...when Dave goes off on his own to inspect the area where the orb picked up a life sign, the tunnel that comes from the juggernaut is biomechanically altered. We can see on the 3d scans that this tunnel leads to the temple which is not formed with the same amount of detail. We don't see the half way point but I'm assuming that what ever made that tunnel came from the ship also made everything else. Thinking back to the derelict there is a tube coming from the ship into the ground as the Nostromo crew are climbing to go into the orifice entry way. Perhaps the ship is a creature thats alive and has made its way down? Puting it's head under the sand like the rest of us. It's not meant to be explainable. It is the vision of artist's, one of them being a surrealist and one of the best at that. The interior of the egg silo is of the same design as that of the pilot chamber, we can agree on that, yes? So that means that both the silo and the pilot chamber have been designed by the same hand/s. So, how can it be explained rationally?.. It can't, unless the viewer suspends their disbelief and realise that it is the work of artists. The silo is meant to be a part of the derelict and that's the way we should view it. It is just a scaling mishap that everyone involved didn't think would be a problem to the viewer. They didn't count on us "cult followers" pulling them up on it! Whether or not you agree with my explination, one thing is for sure, the interior design of the egg silo is the same as the interior design of the pilot chamber. Therefor, both have been designed by the same hand/s. I'll just add this one thing. If Ridley ever did decide to explain the egg silo as being designed and built by a different lifeform to whatever designed/built the derelict, then he would be doing himself a injustice. He would be lying to himself, because he is all about art and design. He once said in an interview, that he is essentially a designer and if he wouldn't have been a film maker, he would have been an interior designer. That's how he makes films, he is all about the look, the aesthetic, and i can confidently assume, that whenever he has watched ALIEN he cannot seperate the derelict from the egg silo. Let me draw u back to the cavern idea...it works logically trust me. One thing you have missed it's that in aliens there was no engineer building the walls in the colony after infestation so it was the aliens building structures like this cavern. And the derelict design is actually subtlety different to the alien walls and again the aliens could of altered the derelict in alien. One main idea is that the alien learns from it's host so it's also bound to make similar structures. Then we have the fact that any number of things could of happened the ship crashed on a cavern that the aliens restructured or it was already made by the engineers or it was discovered by the ship and the ship never took off properly etc etc......I still watch alien as a stand alone film in which this space jockey (not engineer) found the race and was studying it in the caverns below but it got infested and died will trying to take off - and the aliens lived on for a long time down below but moved on or died else were like Prometheus...I keep it slightly open as well my mind as really we cannot know exactly what happened of course. Yes I'm in the camp of the Xenos come from an older race with higher intelligence and they are off shots as such...children as such and soon we will get to see the parent and it's not going to be friendly. @Dj; The walls of the derelict are made up of symetrical, horizontal, parallel bones. BONES. The walls of the egg silo are made up of symetrical, horizontal, parallel bones. The Giger Aliens do not secrete resin in that design. In Aliens, it just looks like a secreted mess. Take a close look at the interior of the pilot chamber, egg silo and the "hive" from Aliens, they just don't look the same, apart from the colour and texture. We all know that Ridley saw it as a battle ship or bomber. That this giant creature was going somewhere, to do something, not very nice with his cargo of bio-weapons. So, both Ridley and Cameron believed that the eggs were the Space Jockey's cargo. Basically, I agree with everything Necronom4 wrote. This is a case of dedicated fans reading way too much into a minor design detail. Please, lets not bring the pyramid concept into this. They changed it before they started shooting. When they built the egg silo, the pyramid idea had already been discarded, therefore one can only assume the place Kane descends to is part of the Derelict. There is no point bringing any other movie than Alien and Prometheus to this discussion. When Alien was made, Aliens wasn't on anybody's mind. And for all we know, Prometheus owes to Alien only.